Melkottai / Melukote also called as Thirunarayanapuram is located in Mandya district, Karnataka. It is surrounded by scenic attractions. It is a famous pilgrimage centre for Sri Vaishnavas.There are two temples. Cheluva Narayana swamy temple,which is famous for 'Vairamudi sevai' and Yoga Narasimha Swamy temple in the nearby hill. Recently, I visited this temple. The temple prasadam 'Melkote puliyogare' is absolutely divine and heavenly. Though the basic ingredients are same, there is a difference in taste between Tamil Nadu temple Puliyodharai and Melkote Puliyogare. Both taste divine with slightly different ingredients. Mess and hotels in the local area also serve this. Some temples in Karnataka also add roasted black til in the 'pudi'. Do plan a visit to Melkote. Personally, I like the spicy Tamil Nadu puliyodharai. Coming to the recipe (Source:Melkote temple), the measurements were given in 'kgs' and I am posting in cups for easy reference and preparation. I dedicate this to Sri Manavala Mamunigal sannadhi of Melukote. Crush jaggery. Soak tamarind and jaggery in lukewarm water and extract thick pulp. Heat a heavy bottomed pan and add the extracted pulp. Stir frequently and allow it to boil until it becomes like a paste. Now add the temperings and keep aside. This is the temple style puliyogare gojju. Click here for home style karnataka iyengar puliyogare gojju. 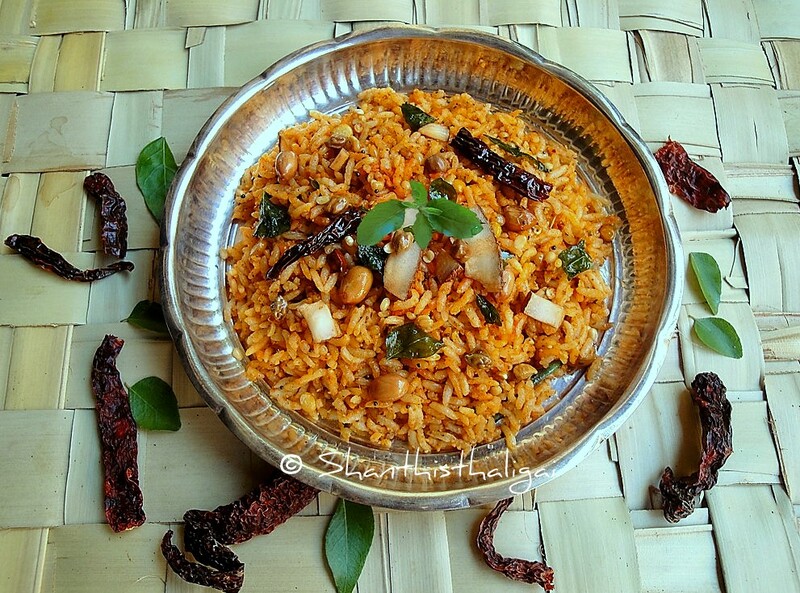 Click here for home style Iyengar Puliyodharai. In a kadai, dry roast the ingredients given for mel podi one by one and powder it when cool. This is the puliyogare podi. Soak rice alongwith turmeric powder for half an hour. Cook rice in such a way that the grains are separate and not sticky. In Tamil, we say it as 'killu padham'. Spread the cooked rice in a plate, add fresh gingelly oil and allow it to cool. When cool, add gojju, mel podi and salt to the cooked rice, according to requirement. Mix gently without breaking the grains. Garnish with dry coconut and Tulasi. Offer it to Perumal. Melkottai / Melkote / Melukote special puliyogare is ready. Mel podi and gojju can be made more using the above ratio and stored in an air-tight container. Raw rice (pachcharisi) should be used. The cooked rice should not be mushy. The grains should be separate without sticking. Only byadge variety chillies are used which give the colour to the puliyogare. Excellent explanation of the recipe that even a beginner cannot go wrong. I haven't tasted Melkote puliyagore and wish to eat. Hi im eager to try ur recipe of this Melkote speciality. One doubt is do we need to take so much tamarind as in 2 tennis ball size ?? Is this for a couple of servings?